Does your campus have a Fundamental 5 success story that must be shared? This is your LAST chance. The call for presenters ENDS on Saturday, August 19, 2017! There are a limited number of presentation slots that are available for educators to share what they have learned on how to better implement The Fundamental 5 in their classroom, campus and/or district. Interested? 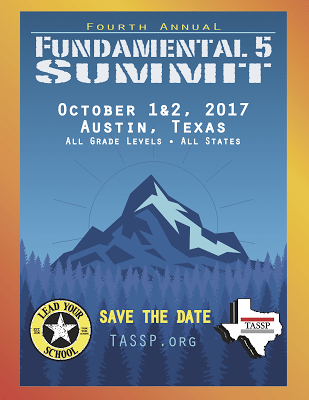 Click on The Fundamental 5 Summit poster. We’ll see you in Austin, Texas in October!